From the moment you are received much as you would be in the home of a good and gracious friend, to the impeccable rendering of state-of-the-art spa treatments, you will recognize this singular difference: your personal importance is paramount. Meaning your personal experience is exceptional. Making the dream complete, we’ve combined this elite cache of spa services with the exclusive dream hair salon – where every service becomes an extraordinary treatment. Dream Spa & Salon…your relaxation destination. For Dream Westport please contact the Spa Director at 203.454.3454. 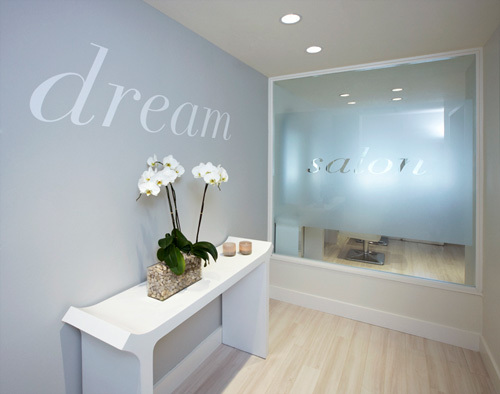 For Dream Greenwich please contact the Spa Director at 203.629.2525. Please arrive for your scheduled appointment with a few moments to spare… this will allow for a smooth transition, a welcome cup of tea and a relaxed service…as a courtesy to all our guests, all treatments start and end on time. Our special environment is designed solely for adults. Of course, young adults with appointments are most welcome. Be assured that your comfort is paramount. As our professional therapists are well-trained in the art of draping, we advocate that you disrobe completely to get the most from your bodywork services. However, should you prefer, disposable undergarments are available. We also provide robes and slippers, blowdryers and showercaps for your convenience. Please mute all cellphones as a courtesy to all dream spa guests. We strongly suggest you schedule any future appointment before you leave or call well in advance to secure your preferred appointment time. We consistently do our best to honor requests for individual professionals based on their availability. Should your day detain you more than 15 minutes from your designated appointment time, we will be happy to offer you an abbreviated service. Should a cancellation be necessary, please be aware that all single services require a 24 hour cancellation; multiple services and packages require a 48 hour notice. If notification is not received in a timely manner, a cancellation fee will be charged. As a courtesy to our staff, failure to arrive for an appointment will result in a charge for the time reserved. A credit card or gift certificate will be required to hold your reservation. We accept Visa, MasterCard, American Express, debit cards and personal checks with proper identification. Gratuities are greatly appreciated but not included in the cost of your service. We appreciate your generosity but regret that we are unable to include gratuities on credit cards. An ATM is available for your convenience. Thank you for your cooperation. All prices/services are subject to change without notice. We always honor gift certificates with specified service costs for one year. Series of services are available at a special savings please inquire. Please leave valuables at home — Dream is not responsible for loss or theft. Give the gift of dream… dream gift certificates are always well received… any denomination, service or products can be specified. Call ahead and we’ll prepare your gift to go! All gift certificates are non-refundable and non-transferable. Gift certificates must be presented upon arrival. Gift certificates do not expire, however, donated gift certificates have a one year expiration. It is our express desire to exceed your expectations. If there is anything that will make your visit more enjoyable, please feel at liberty to ask. We will do our very best to accommodate your wishes. We always welcome your comments and suggestions. We are pleased to offer our location as a corporate retreat or special events destination, where the entire facility may be reserved.